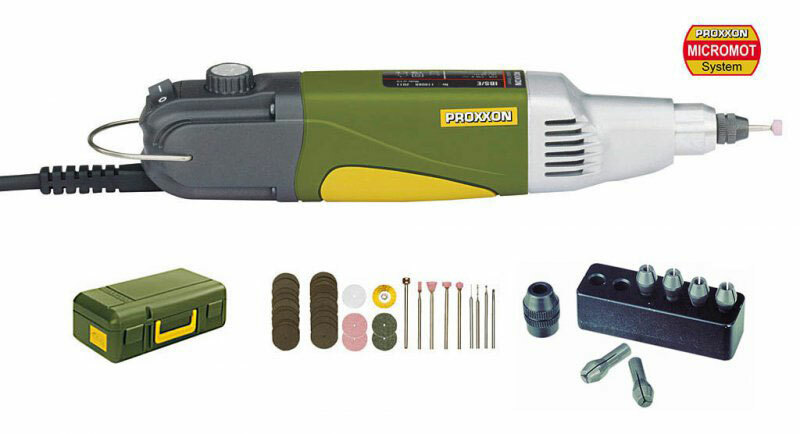 For drilling, milling, grinding, polishing, cleaning, cutting, carving, engraving and signing. For precision mechanics, model builders, jewellers, opticians, artists and electronic enthusiasts. High concentric accuracy (maximum runout 3/100mm). No runout in your bits and cutters. This high-revving, special balanced, low noise DC motor has fullwave electronic speed control. The ground steel spindle runs in a ball bearing. Six high concentricity MICROMOT collets, (1.0 - 1.5 - 2.0 - 2.4 - 3.0 and 3.2mm and closure nut) are included. Speed 5,000 to 20,000rpm. Power consumption (max) 100W, 220 - 240V. Stable head of die-cast aluminium and main housing of glassfibre reinforced POLYAMIDE with soft components in the finger grip area. Length 230mm. Weight approx. 500g. Insulated to class 2. The 20mm MICROMOT collar allows fitting of optional drill stands, horizontal stands, etc. Supplied with 34 bits and cutters in a stable plastic case. Ball bearing spindle of ground steel with lock button for rapid cutter changing. Quiet, powerful 100W motor with full wave electronics for speeds between 5,000 and 20,000rpm. Streamlined head of die-cast aluminium for exact bearing seats and optimal stability. Quality without compromise: isolation according to class 2 requirements. With 34 bits and cutters of industrial quality, all shafts Ø 2.35mm. Complete with six triple slit steel collets covering 1.0 to 3.2mm. As described below. Fit all handheld MICROMOT machines, excluding the engraver GG 12. One each 1.0 - 1.5 - 2.0 - 2.4 - 3.0 and 3.2mm, clamping nut and holder for storage are included. MICROMOT steel collets are hardened and thus have a high, consistent flexibility. They also maintain prolonged accuracy, even after regular use (these collets should not be compared with unhardened, fourslit collets of brass and aluminium). The triple slit collet is substantially more difficult to manufacture than the four-slit type, but offers a better load-bearing surface. This is especially important for cutters with small shaft diameters. Storage case of high-grade polypropylene. Attractive design, very sturdy and large enough to put the machine back in the case after completing work, without having to "fumble". A label on the side identifies the contents. 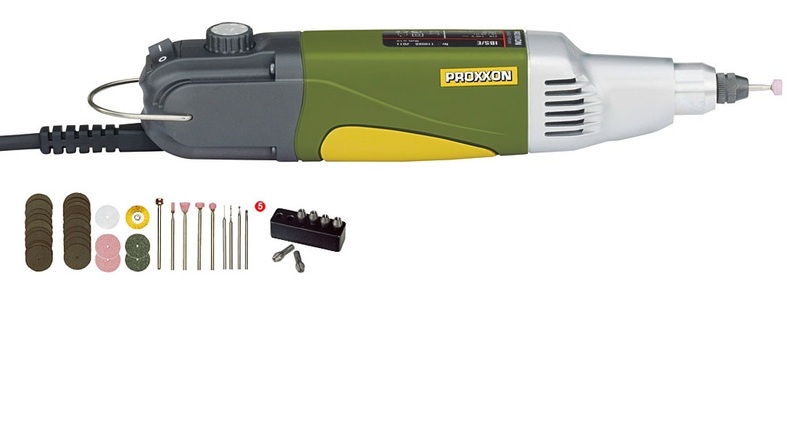 Click the button below to add the PROXXON Professional drill/grinder IBS/E 28481 to your wish list.